President-elect Rodrigo Duterte showed his rivals how to squeeze the most from campaign funds. Duterte spent less than half o‎f what his rivals consumed for each vote they tallied in the May 9 elections. Based on the total votes cast and their reported campaign expenses, Duterte’s votes were the cheapest as he spent only P22.37 per vote or roughly 50 percent ‎below the average cost of a vote at P43.67. Fourth-placer Jejomar Binay had the most ‎expensive votes at P85.55 each or double the average cost. 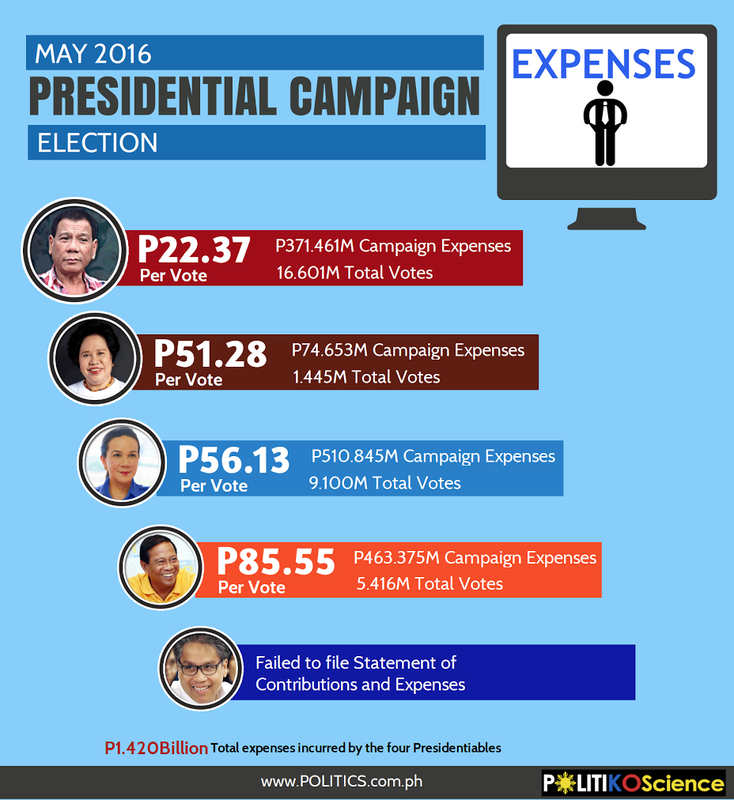 Binay’s votes are four times more expensive than Duterte’s. Sen. Miriam Defensor-Santiago placed fifth but her votes cost only P51.13 each or 17 percent higher than the average cost. ‎Third-placer Grace Poe spent P56.13 for each of her votes or 28 percent higher than the average vote. Liberal Party bet Mar Roxas’s cost per vote could not be computed because he‎ failed to beat the deadline for the filing of statement of contributions and expenses with the Commission on Elections on 8 June 2016.